Who is it for? Garnier Skin Naturals Hydra Bomb Serum Mask is a new generation of tissue mask that infuses skin with 1 week of serum in 1 mask. A tissue facemask for normal to dehydrated skin. Its super hydrating formula is enriched with pomegranate extract and hyaluronic acid to the intensely re-hydrate skin for a more radiant and rejuvenated complexion. It is recommended to use it 3 times in a week. Read on to know how it worked for me. Rs 99 for 1 mask and is available at nykaa. Carefully apply the white tissue side on the clean skin. Remove the blue peeling, which is the protective film. Adjust the mask to the contours of your face. 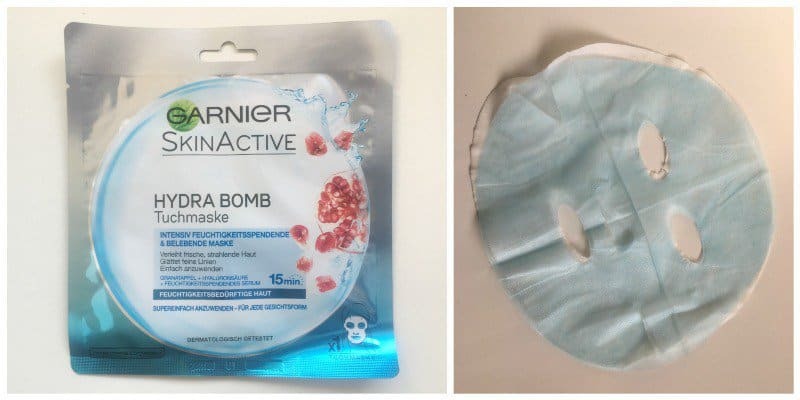 Garnier Sakura White Super Hydrating Pinkish Glow Tissue Mask comes in a sweet packaging showing a gradation from silver to blue color and with pomegranates picture on it. The package can be opened easily and inside it is the mask drenching in the serum. All the claims and the instructions are written on the mask. It quite travels-friendly. The mask gives a pleasant fragrance and the serum is lightweight, which is easily absorbed by the skin. My skin was feeling dull and lifeless. After exfoliating and applying a clay mask, I put this sheet mask on. There was no tingling sensation and the mask in itself was pleasant. I put it on for around about 20 minutes. After 20 minutes I massaged the excess serum on my face and neck. After some time I could feel that my skin is hydrated and refreshed. And I could still feel the effect of the mask even after 3 days. It provides instant hydration to the face. Is suitable for oily, acne prone and sensitive skin. It’s best suited for people with dry skin. Comes with a protective film which makes it easy to handle. A good fix before going to the parties or any other gathering. What I dislike about the product? Makes oily skin appear too oily, so people with oily skin can try sakura serum mask as it suited me best. Yes, I’ll definitely recommend it and I can not wait to try another variant also. Yes I liked this product but I still think Korean products are better.